At the 2012 IPCPR Trade Show, indie cigar company Elogio launched a new line called “Excentrico by Elogio”. This blend marks the fourth line by Elogio (joining LSV, Habano, and Excepionales). 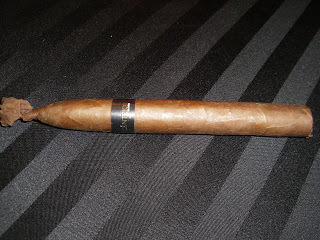 The Excentrico marks a change of pace cigar in that it is probably Elogio’s most multi-national blend to date. The Excentrico has started making its way to Elogio authorized retailers. I recently have had an opportunity to smoke this new release, and in my opinion this could be some of the best work by Elogio to date. done to meet demand while delivering a high quality product. Sabbah worked with the factory to make a cigar to match this profile. When Elogio first came on the scene, they were known for their Nicaraguan puros. Last year, they began to introduce Ecuadorian Habano wrapper on their LSV line and for Elogio Excepionales. The Excentrico makes use of this wrapper, however it is also the first Elogio to utilize Dominican tobacco. This makes the Elogio a true multi-national blend – and a definitely change of pace for what the company has been doing to date. The Excentrico is currently available in one size – a 7 x 54 vitola with a torpedo tip and fan-tie. The cigars are packaged ten to a box. The initial release of the Excentrico has been limited to 200 cigars (2000 boxes). The Excentrico features a medium brown, almost chocolate-like wrapper. There is somewhat an oily complexion to the wrapper. The wrapper can be considered somewhat toothy. There are visible wrapper seams and veins present. Two important features of the appearance of the Excentrico are the covered foot and large fan-tie on the torpedo tip. The band is a simplistic, yet attractive one. The band has a black background. The text “EXCÉNTRICO” is in copper font on the front of the band. Below that text – aligned on the right is the text “BY ELOGIO”. On the back of the band is the text “ESTELI” in white font and “NICARAGUA” in copper font. For my cigar experience with the Excentrico, I opted to place a straight cut into the tip of the torpedo as opposed to pulling off the fan cap. I proceeded with the pre-light draw. Since the foot of this cigar is covered, the dry draw did not produce any deep flavors. I still was able to pick out flavors of leather, cocoa, cedar, and cream. Despite the fact the notes were subtle, there was enough of an appetizer here to have me interested in firing up my Excentrico. Therefore, it was time to toast the foot and see what this cigar experience would bring to the table. The initial draws to the Excentrico yielded a combination of sweet berry, cream, and pepper. The pepper spice had a little more presence on the early draws of this cigar. The pepper then dialed back and joined the berry and cream notes. The three notes then started to move in and out of the forefront. At the one third point, there were chocolate and floral notes in the background. These notes were joined in the background by the berry and pepper notes. It was also at this point where the cream notes took control as a primary flavor. By the middle of the smoking experience, the cream notes were still in control. The floral and pepper notes remained in the background as secondary notes The berry notes had dissipated and the chocolate notes diminished and became a more tertiary note. In the last third, the flavor profile became more leathery and peppery. There was definitely a spicy component on the close of the cigar experience. The cigar also got somewhat harsh at the very end. The resulting nub was soft and lukewarm. traditional parejos in the construction attributes of burn and draw. In the case of the Excentrico, the burn and draw performed well. The burn line remained relatively straight – requiring very few touch-ups. The resulting ash had a couple of points where it flowered, but for the most part it was a tight ash that was white and gray in color. The burn temperature was ideal for most of the cigar – getting a little lukewarm at the end. The burn rate was actually a little on the slow side. This wam burn and slow rate might have contributed to the harshness at the end. 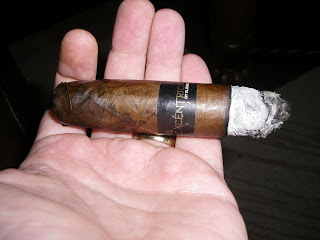 The draw was ideal – making the Excentrico a very good cigar to puff on. From a nicotine standpoint, the Excentrico is not going to overwhelm you. It is one of those cigars that gives you just the right amount of nicotine. I assessed the Excentrico to be a medium strength cigar. As for the flavors, they have a lot of depth and are robust. I assessed the Excentrico to be a full-bodied cigar. There is no doubt that this is going to be a cigar that emphasizes flavor over strength. Overall, this is a very good release from Elogio. It definitely is the best cigar from a flavor standpoint. This also delivers a complex flavor profile with a lot of transitions. The only negative was some of the harshness I got at the end. However, I typically am a person who not only nubs a cigar, but strives to make it a finger-burner. The price point for this cigar is in the $15-$16 range for SRP. While we don’t factor price into a final assessment rating or score, we do mention it to inform the consumers on this. Overall this is a great cigar for the novice cigar enthusiast looking for a flavorful cigar without too much power. Experienced cigar enthusiasts looking for a similar profile will be satisfied, however I probably would recommend this more toward those that seek a medium strength cigar. From a personal standpoint, this is a cigar I look forward to smoking again. Source: The cigars for this assessment were purchased from Outland Cigars in Charlotte, North Carolina.